Coprinopsis romagnesiana is, more or less, a scaly version of the well known inky cap Coprinopsis atramentaria. But while the latter species has a gray cap with a few tiny scales over its center, Coprinopsis romagnesiana is prominently decorated with brown to orangish brown scales. Like other coprinoid mushrooms, it features gills that turn black with age and eventually liquefy, creating an inky goo. The distribution of Coprinopsis romagnesiana in North America is uncertain. I found the illustrated collection in northern Michigan, during morel season, and McNeil (2006) describes it from nearby Quebec. But if you agree with me that "Coprinus atramentarius var. 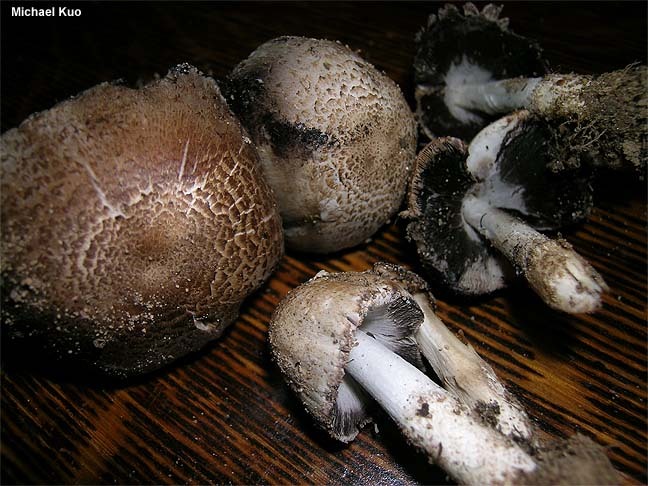 crassivelatus," described by van de Bogart (1979) from Washington State, may be the same as Coprinopsis romagnesiana, the North American range for the mushroom might best be stated as "northern." Coprinus atramentarius var. squamosus is a synonym, as is Coprinus atramentarius var. romagnesianus and Coprinus romagnesianus. I suspect that Coprinus atramentarius var. crassivelatus (van de Bogart, 1979), described as a variety in which "the universal veil is more abundant and breaks up into areolate patches on the pileal surface," is also a synonym. Ecology: Saprobic, growing in clusters on stumps or from senescent roots around stumps; spring and summer; northern Michigan and Quebec--possibly throughout northern North America. Cap: 3-6 cm across; oval when young, expanding to bell-shaped or broadly convex; whitish to beige underneath tan to brown or orange-brown, adherent scales. Gills: Attached to the stem or free from it; white at first, becoming purplish black; eventually deliquescing (turning to black "ink"); crowded. Stem: 6-10 cm long; up to about 1.5 cm thick; more or less equal; white; hollow; sometimes with a slightly sheathed appearance or a slightly rimmed basal bulb. 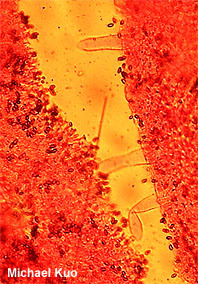 Microscopic Features: Spores 8-13 x 5-6 µ; elliptical; smooth; with a central pore. Basidia 4-spored; surrounded by brachybasidia. Hymenial cystidia cylindric to utriform; up to about 150 µ long. Pileipellis a cutis. Veil elements more or less cylindric; up to about 20 µ wide. Clamp connections present. REFERENCES: (Singer, 1951) Redhead, Vilgalys & Moncalvo, 2001. (Moser, 1983; Uljé, 2003; McNeil, 2006.) Herb. Kuo 05230504.